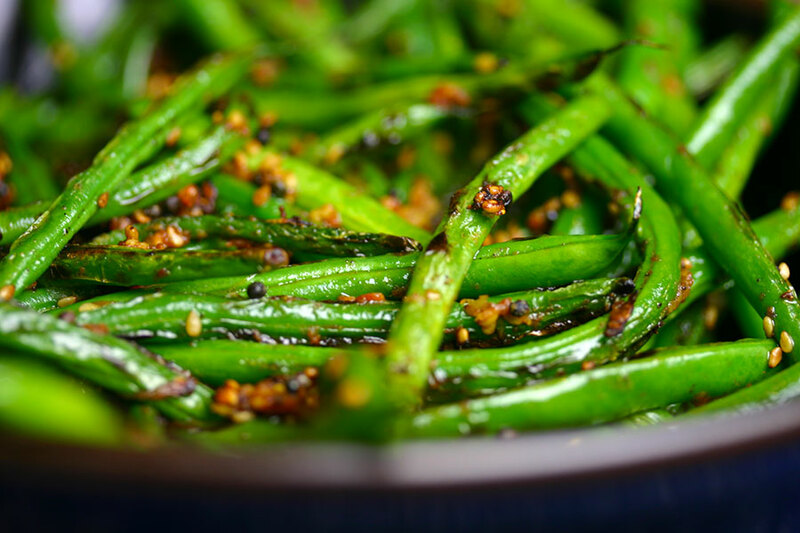 These Gujarati green beans with mustard seeds and ginger make a lovely side dish to an Indian meal. The combination of stir frying and steaming results in vibrant green, crunchy beans. I was unsure about adding tomato purée straight to the pan without any other liquid, but loved the way it fused with the spices. The recipe is from Meera Sodha’s Made in India, a collection of recipes based on the Gujarati home cooking that she grew up eating in Lincolnshire. Heat the oil in a lidded frying pan over medium heat. Add the mustard seeds and sesame seeds. When the mustard seeds begin to pop, add the beans. Stir fry for a couple of minutes, then add the ginger. Stir fry a couple of minutes more, then stir in the tomato purée, turmeric, salt and pepper. Cover the pan, lower the heat and cook for another five minutes, or until the beans are tender.